Philip Elmer-Dewitt and Mike Daisey at Macworld Expo. Photo by Glenn Fleishman. 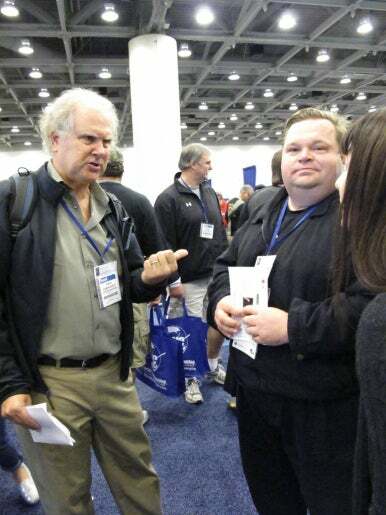 At Macworld Expo 2011, I ran into Mike Daisey on the trade show floor. He was taking a walk around with Philip-Elmer DeWitt of Fortune and a producer from the regional theatre company that planned to mount the show they had helped workshop, “The Agony and Ecstasy of Steve Jobs.” I was not precisely pleased to see him, and we chatted awkwardly for a moment, before they went on their way. The show toured widely, Daisey became a much-quoted and videotaped expert on Apple’s supplier factories in China, and This American Life aired a shorter version of it in collaboration with Daisey. It all came apart Friday, when This American Life retracted their endorsement of Daisey's work. I’m not surprised a bit, but it makes me blue how this played out. I met Daisey in Seattle over a decade ago when he developed the monologue that put him on the map, “21 Dog Years,” later expanded into a book. I had worked at Amazon for six months in 1996–1997, and called Daisey up for lunch. We became something between acquaintances and friends. He took “21 Dog Years” on the road, and had a successful off-Broadway run. I saw the show again there, bringing a bunch of Mac writers and New York friends during the last Macworld Expo in that city. I saw a later version when a theatre company that produces typically “classic” theatre brought him back for a run, and participated in an on-stage discussion by past Amazonians after one performance. He and I have lost touch in the years since, but I followed his career arc until he had become something akin to Spalding Gray, if not yet quite as well known. That made our encounter in 2011 difficult. Because I knew that Mike doesn’t speak literal truth in his performances. Unless a play or monologue is presented as being factual, one knows that the narrative is shaped to the needs of the form. The Amazon story (both play and book) was full of elements that I either know for a fact, learned from friends and colleagues, or could intuit were not factually precise or were fabricated. That is fine in the theatre, although perhaps a disclaimer such as Gray’s at the outset of this article would have helped. Performers who tell stories are there to tell stories. They paint a world you inhabit during a performance and play your emotional piano. With a good script and good performers, you leave with insight, but not necessarily new facts. And that would be why the This American Life debacle seemed inevitable. By early 2011, before I ran into Mike at Macworld Expo, I thought it likely that parts of "Agony" were dramatizations of things he had seen and heard about, made larger than life. I thought it might be a good item for the Economist, where I write a few items a week for its Babbage blog. I started to work on a brief article… and found myself mired again and again when I came to the details of what Mike was claiming based on what I had gleaned from show excerpts, his blog, and interviews he had given. I did not doubt that conditions in Foxconn and other Chinese factories could be dangerous and difficult for employees. The vast majority of workers in all industries work harder every day of the week than the vast majority of workers in the United States and other developed nations. That is a fact we must all confront, and which has been highlighted more in the last two years than the last two decades. It is not an Apple-specific problem, nor one specific to foreign companies doing business in China. But Daisey could not have gathered the amount of information he alleged he did for the show in a week in China. Daisey describes himself, in a PDF transcription of one performance of the show hosted on his site, “And at the end of the day, I am large, I am American, and I am wearing a f——— Hawaiian shirt.” Daisey claims to have walked in with a translator to Foxconn and other plants and to have talked to dozens of workers. Long-form non-fiction, the stuff that the Atlantic, Harper’s, and The New Yorker specialize in, requires enormous amounts of time to gain the trust of people, gather information, put the pieces together. A single visit and random encounters aren’t enough. Daisey’s translator says that almost nothing Daisey says occurred did, and Daisey confirmed specific incidents were fabricated to Ira Glass. When “Agony” came to Seattle, I received a few emails from Mike, with whom I hadn’t corresponded or seen in a while. I believe he sent three, and each one caused me paroxysms of agony. I did not want to see the show, and did not want to confront the fact that my logic insisted that Daisey had made up incidents he had now spent a year outside the theatre claiming as true in countless print and televised interviews. He had taken a theatrical work and turned it inside out, perhaps never evaluating whether the reality of what he experienced as a performer inside the show could be matched by objective reality. But then, of course, This American Life would never have come calling.